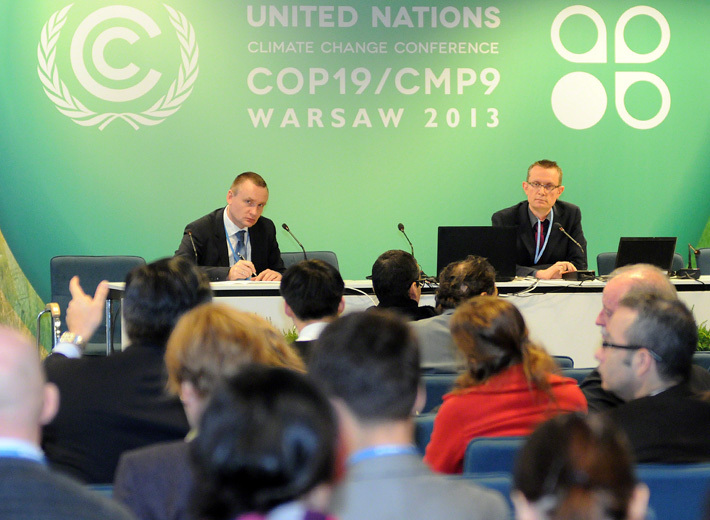 IISD Reporting Services (IISD RS) is providing daily web coverage from selected side events at the Warsaw Climate Change Conference - November 2013. This session, moderated by Dolf Gielen, IRENA, focused on the role of renewables in global GHG mitigation and the potential to further strengthen this role. Gielen introduced the panel and presented on the Global Renewable Energy Roadmap (REMAP 2030), an ongoing IRENA project. He addressed the mission, scope and mandate of IRENA, stressing that in 2010, renewable energy (RE) accounted for 18% of total final energy consumption globally. He reported key findings of the REMAP 2030 project, inter alia: it is feasible to double the share of RE at roughly zero net cost; there are important benefits in terms of health and GHG mitigation; biomass is an important factor; and there is more to be done to promote RE in end use sectors. Magdalena Preve, Ministry of Housing, Land Planning and the Environment, Uruguay, discussed the significant contribution of RE to the primary energy and power generation mix in Uruguay and focused on the role of renewables in Nationally Appropriate Mitigation Actions (NAMAs). She referred to specific NAMA projects, inter alia: construction of a liquefied natural gas (LNG) terminal with regasification capacity of 10,000,000 m3/d of natural gas; promotion of RE participation in the Uruguayan primary energy mix; and introduction of solar photovoltaic (PV) energy. Franck Jesus, the Global Environment Facility (GEF) Secretariat, said that to develop RE further, we should: solve “higher capital costs”; reduce investment risks; reduce the need and cost of a price premium; remember off-grid challenges; and focus on quality, standardization and capacity building. He further underscored: the role of innovative, transformational technologies; measures and mechanisms to accelerate the uptake of mitigation technologies; and the integration of RE within broader challenges. Mark Radka, UN Environment Programme (UNEP), stressed that development in the RE sector can provide a sense of enthusiasm, well needed in the negotiations, and underscored the importance of credible evidence. He said more countries should have NAMAs on RE and addressed the role of RE to bridge the emissions gap. He said there are still great opportunities to reduce emissions, pointing to heating applications and asking for good practices and policies to be disseminated. In the ensuing discussion, participants posed questions on, inter alia: the average incremental cost of substitution; transmission and storage costs; IRENA’s positioning in relation to other energy-related institutions; measurement, reporting and verification (MRV) of NAMAs; risk tolerance in terms of innovative technologies; and integration of RE within broader challenges. The Earth Negotiations Bulletin on the side (ENBOTS) © <enb@iisd.org> is a special publication of the International Institute for Sustainable Development (IISD). This issue has been written by Tasha Goldberg, Jennifer Lenhart, Anna Schulz and Asterios Tsioumanis. The Digital Editor is Brad Vincelette. The Editor is Liz Willetts <liz@iisd.org>. The Director of IISD Reporting Services is Langston James “Kimo” Goree VI <kimo@iisd.org>. The opinions expressed in ENBOTS are those of the authors and do not necessarily reflect the views of IISD and funders. Excerpts from ENBOTS may be used in non-commercial publications only with appropriate academic citation. For permission to use this material in commercial publications, contact the Director of IISD Reporting Services at <kimo@iisd.org>. Electronic versions of issues of ENBOTS from the Warsaw Climate Change Conference - November 2013 can be found on the Linkages website at http://enb.iisd.org/climate/cop19/enbots/. The ENBOTS Team at the Warsaw Climate Change Conference - November 2013 can be contacted by e-mail at <anna@iisd.org>.